By 2015, students will be carrying digital textbooks in lieu of paperback books in all schools in South Korea, according to the Ministry of Education, Science and Technology. 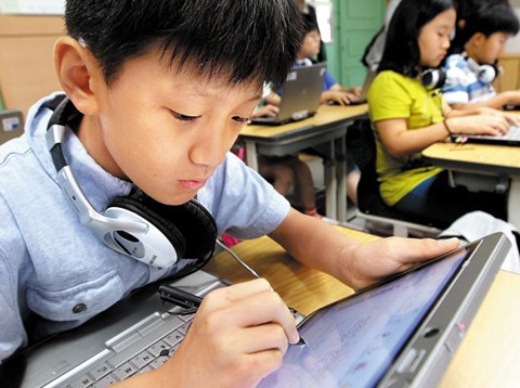 Taking advantage of cloud technology, the ministry said that it will invest KRW 2.2 trillion (US $2 billion) to convert textbooks to digital with links to various multimedia content, establish massive servers and WiFi networks in schools, and provide free tablets for students from low-income families, reports The Cosunilbo. It’s likely that the government will choose tablets manufactured by South Korean electronics giant Samsung, over U.S.-based Apple’s iPad, as some schools in Korea have started using it already for a similar initiative. “We don’t expect the shift to digital textbooks to be difficult as students today are very accustomed to the digital environment,” a ministry official said. The government expects that the new educational plan will help students establish their own study patterns based on individual needs by giving them online access to their lessons and other educational resources. Students who miss classes will also be able to catch up by attending substitute online classes, which would be recognized as attendance. Technology and the Internet has revolutionized education all across the globe. While South Korea is the first to declare a country-wide plan to shift to digital textbooks, it shouldn’t come as surprise to see other countries follow suit seeing as digital content is slowly taking over traditional media.